Remember when you attempted to put together your child’s first instructions – enclosed, all parts included, no batteries required toy? So many steps had to be done a certain way that you had to refer to the instructions many times. And if you are like most of us, you felt uncertain, and inept and uncoordinated. When a child is asked to duplicate a given pattern, following a series of steps that result in an end product, the same feelings emerge. Class craft projects maybe cute to put in the family scrapbook or nice to send to grandma, but they do little for your child’s self-esteem, and cognitive development and creativity. That’s why blank paper, scissors, paint, markers , glue, and a variety of other materials to choose from are available at all times in our classroom. 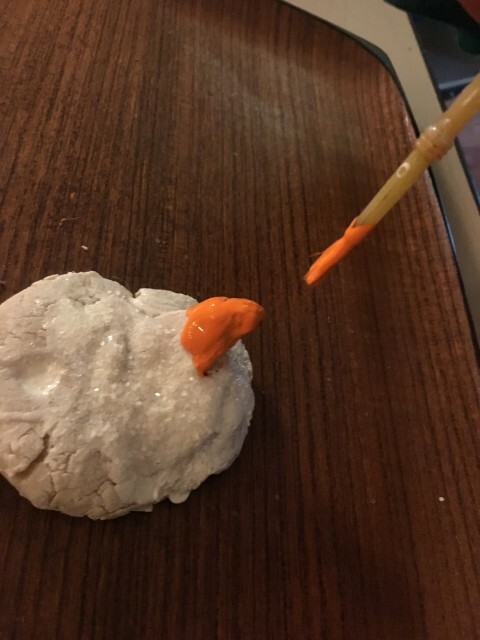 Children are encouraged to use the materials to make their own creations. 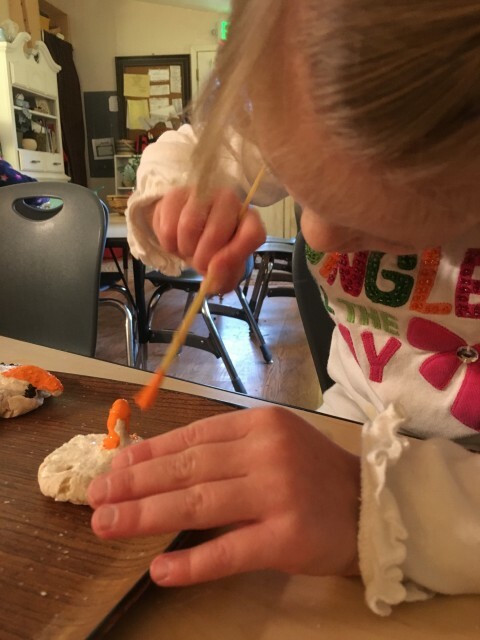 When we do a special art activities with the children, we may introduce a new material or even demonstrate possible ways to use some tools and materials, but the children then decide what they want to create themselves. The children care more, learn more, and enjoy an activity more when they produce their own creations –not copies of ours ! I cherish my handmade copies of ornaments on my tree and I feel certain you will too. No children were harmed and it was super quick. 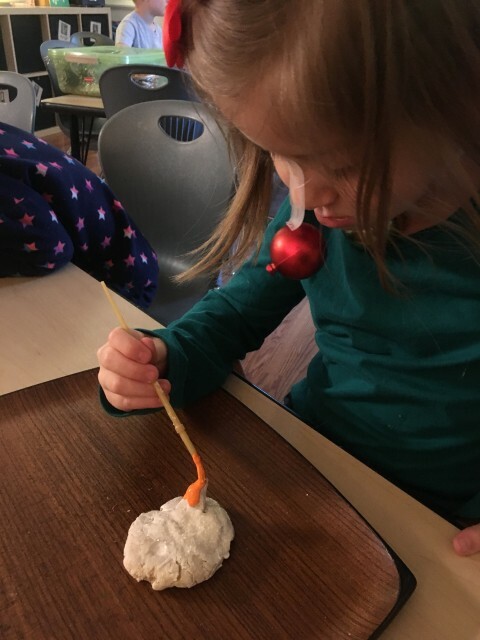 We will be saving the ornaments we make in a box to send home before Christmas. 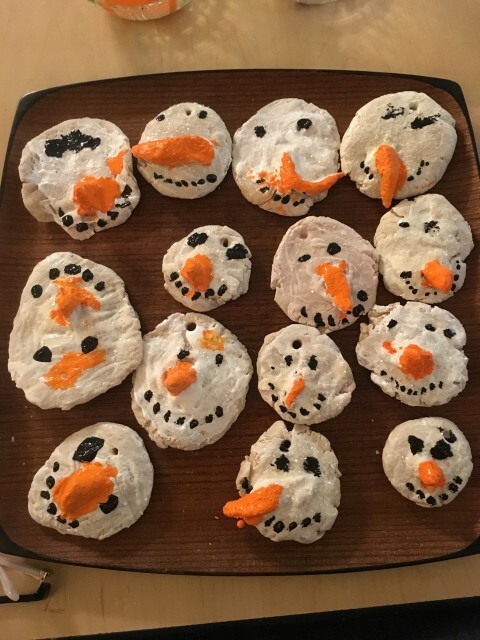 Aren’t those the cutest little snow men you’ve ever seen ?